“Long-term agreements such as the one we have now made with Ganfeng for the most important raw material, lithium, have decisive strategic importance for the implementation of our ‘E-Offensive’,” says Dr. Stefan Sommer, Group Board of Management member for Components and Procurement at Volkswagen AG, thus formulating the extreme importance of the long-term lithium supply for the Volkswagen Group at the start of the electric era. The joint Memorandum of Understanding (MoU) with the Chinese lithium producer ensures security of supply in the key technology of the future - and makes a decisive contribution to implementing Volkswagen's ambitious Group goal of launching the largest E offensive in the automotive industry and has projected 22 million E vehicles worldwide by 2028. The Volkswagen Group is pressing ahead with the fundamental system change in individual mobility and is consistently focusing on electric drives. Over the next ten years, the Group intends to launch almost 70 new e-models - instead of 50 as previously planned. This will also increase the number of e-vehicles to be built on the Group's e-platforms in the next decade from 15 million to 22 million. Michael Bäcker, Head of Procurement for Electric Mobility at Volkswagen AG, explains: “The strategic cooperation with Ganfeng is the result of an intensive analysis of the markets by the Volkswagen Group’s e-Raw Material Team. This specialized team focuses on targeted relationship building with companies in the raw materials industry. Together with specially selected strategic partners, Volkswagen is working on synergies along the value creation chain for HV batteries. 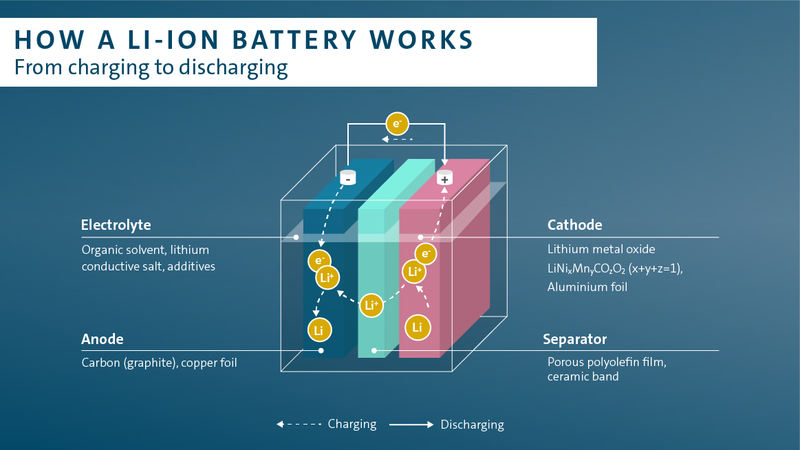 As well as securing capacities at competitive prices, the Group’s particular focus is on sustainability.” But why is lithium so important for the production of electric car batteries? And how will Volkswagen secure a sustainable supply chain? 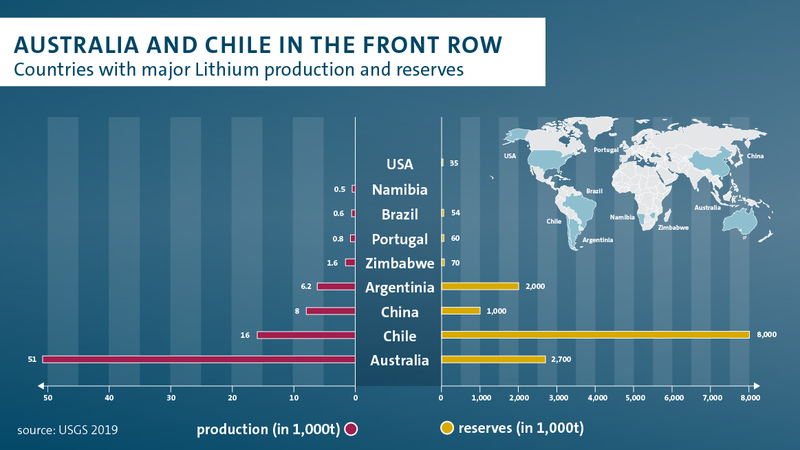 Lithium will in the near future be one of the most sought-after raw materials on earth. According to forecasts, the worldwide demand for lithium will more than double by 2023 – largely owing to processing in car batteries. Basically, five main raw materials are required for the production of lithium-ion battery cells for electric cars. On the cathode side, a compound of the elements cobalt, nickel and manganese functions through its structure as a storage location for the charge carrier lithium, on the anode side this is graphite. Lithium is also contained in the electrolyte. Lithium is currently regarded as an unrivalled charge carrier that will be irreplaceable for the foreseeable future, as no other element offers comparable properties for automotive battery applications. Accordingly, securing access to raw materials and the market is essential. It is a different matter, for example, for cobalt: the percentage of this raw material is to be reduced from its present 12 to 14 percent (weight proportion in the cathode) to five percent within the next three to five years. Volkswagen is working on further development of cobalt-free batteries. The alkaline metal lithium occurs in numerous countries. A distinction is made between extraction from salars and extraction from ore mining. Mining is considered the future-proof solution, both commercially and in terms of sustainability. Lithium extraction in salt lakes – predominantly in Chile, Argentina and Bolivia – is deemed difficult to calculate, since the evaporation process can be severely affected by rain, snow and natural contaminants in the material, and the impact on the environment (for example, on the groundwater level) can be potentially problematic. Lithium extracted from mining for the future-relevant intermediate product “lithium hydroxide”, on the other hand, is commercially more attractive (there is one less production step as compared to salar production), more stable to extract, easier to scale and generally more sustainable. The world market leader in ore-based production is Australia, a country with a stable political system, a high degree of transparency and ambitious environmental standards. The future Volkswagen supplier Ganfeng extracts material from several mines there. Furthermore, lithium extracted from ore is more suitable for batteries of the next generations. As part of its partnership with QuantumScape, Volkswagen aims to start small-scale production of solid cells as of 2025. “We are focusing on lithium from the mining industry, because this form of extraction means more stable prices, guaranteed capacities and transparent sustainability”, says Michael Bäcker. Recycling also plays an important role in the Volkswagen Group’s lithium strategy. Today, it is still difficult to recuperate “technical lithium” using the current battery recycling processes. 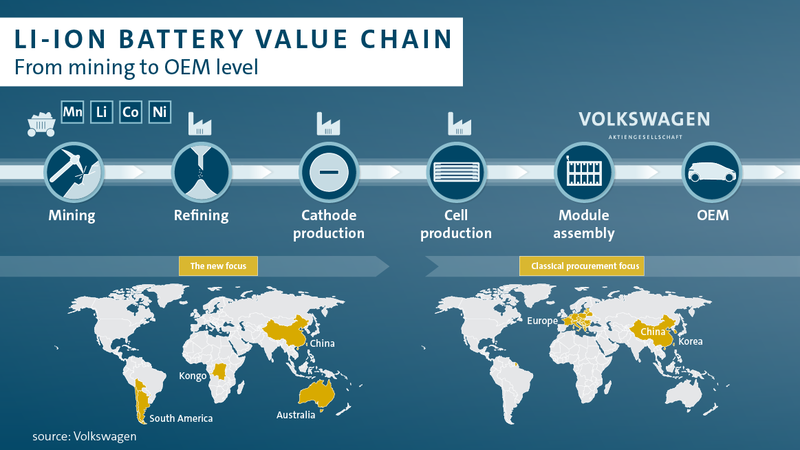 That’s why the Volkswagen Group is working on its own process to recycle lithium in a cost-effective way. In addition, Volkswagen has been conducting research since back for a long time on how more and more materials can be repurposed by means of battery recycling – for example, by “2nd life” applications in stationary storage devices, re-manufacturing, or “closed loop” concepts. By the end of 2019, the Group plans to set up a recycling facility in Salzgitter in which innovative recycling processes will be developed. However, it is expected that batteries will not be returned for recycling in significant numbers until 2030.